Despite the growing range of its competitors, the Volkswagen e-Golf remains one of the most attractive and easy to live with electric options. Since it first arrived in 2014, the Volkswagen e-Golf has had the unique selling point of being a fully electric version of an already successful and instantly recognisable existing model. 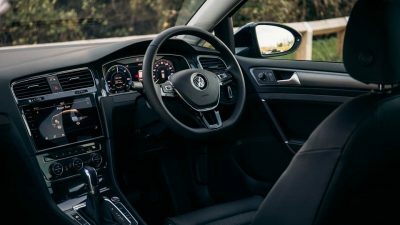 The Golf rarely strays from the top three selling cars in the country, and save for a few subtle styling cues, is practically indistinguishable from its much loved ICE counterpart. Five years on and the competition in the electric car market is heating up rapidly. Despite rivals which can now offer longer range for better value, it’s still difficult to match the no-compromise, familiar appeal of the e-Golf. Many of us will already be familiar with the dimensions of the e-Golf, as they are almost identical to the standard family hatch. This means a generous amount of room in the back row, Isofix anchors for car seats and all the same useful cubbies and cupholders scattered throughout the cabin. Where it does differ slightly however, is the boot space. It loses almost 40 litres to the battery pack as well as the handy hidden floor of the standard model. While that might not sound like a lot on paper, it is worth checking to see if it is still going to be able to carry all that you need it to – certain types of pushchairs and buggies can already be a tight squeeze in a hatchback. 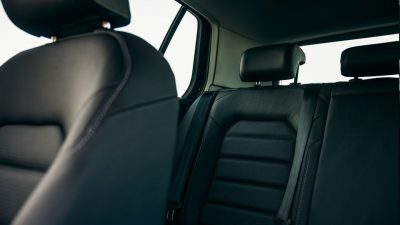 Specwise ,the e-Golf has its own unique trim which for those familiar with Volkswagen trim levels lies somewhere between the Comfortline and Highline in terms of standard features. 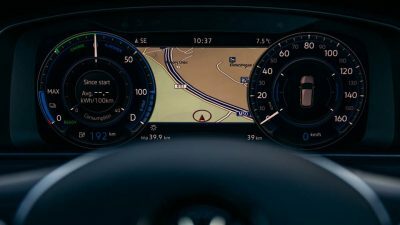 Highlights include Climatronic air-conditioning, adaptive cruise control and an upgraded 9.2 inch touchscreen with the impressive Discover Pro Navigation system. It’s the same system as you’ll find in the rest of the range with some extra functionality relating to the battery usage which will allow you to time charges and keep an eye on your overall energy consumption. Things that set it apart on the outside in terms of styling are the e-Golf badges, a unique set of C-shaped daytime running lights, and a somewhat controversial set of 16 inch Astana Alloy wheels. Although built especially to be lighter and more aerodynamic, their flat frisbee-like appearance does tend to divide opinion somewhat. Luckily for some, there is now the option to upgrade to the Executive Edition which swaps those out for a more standard looking set of 17 inch ‘Madrid’ alloys, and adds a tonne of extra equipment including a reversing camera, keyless go and a fully digital instrument cluster. It does this while managing to stay just a shade under the €50,000 limit set for 0 per cent Benefit in Kind, making it a very tempting and cost-effective choice of company car. All e-Golfs come with a Pedestrian monitoring system, ‘front assist’ emergency braking, and a driver alert system as standard. The WLTP range of this latest version of the e-Golf is 230km. It’s not the most impressive range on the market by any means, but if you are one of the 71 per cent of drivers we surveyed with a daily commute of less than 90km return, still very workable, particularly if you can pair it with a home charge point. This more or less removes the issue of the still-developing public charging network, which is only really meant to cater for longer distance journeys. A full charge takes approximately eight hours, meaning it makes most sense to charge overnight. A reading from our ELVI home chargepoint (kindly provided to us by Charged.ie for the purpose of this review) informed us that a full charge (from almost empty) costs approximately €6. Switch to a night-time electricity rate and you can almost half that. So in theory, a full charge (€3 – €6) should get you about 230km. In the case of the e-Golf, this will most definitely be lower in cold weather and we saw a dramatic reduction in range during our (admittedly unusually cold) test week. The fully charged range could vary from anywhere between 180 and 280km depending on outside temperatures, and fell dramatically with the air con on. 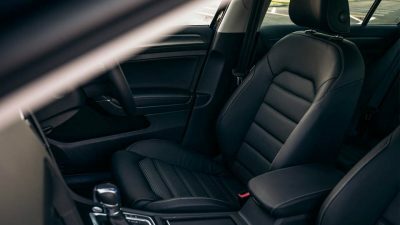 There are ways to counteract this slightly – an app will allow you to preheat the car while it’s still charging, and making use of the optional heated seats to negate the need to blast hot air. Over a mixed week of driving and circumstances, we still feel a comfortable range of 200km is possible, without any major change of driving style. As for what it’s like to drive – we are all probably well aware by now of the instant torque, and quiet smooth ride that electric powertrains deliver. The e-Golf is even more impressive in this regard as it manages to combine those advantages with handling so familiar, and so utterly normal that it’s even easier to appreciate those advantages. It makes it very easy to forget you’re in an electric car at all. That is essentially the e-Golf’s strongest attribute. There is so very little thought involved. It’s just a Golf, that happens to be electric. 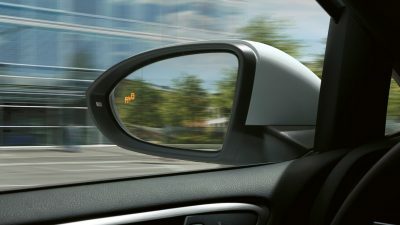 It will face fierce competition this year from rivals such as the Hyundai Kona EV, and Kia e-Niro which will offer considerably longer distance for those who want the reassurance of being able to tackle longer distances on a single charge. For those more concerned with the daily commute, the e-Golf is still a very appealing option.